. @ITIFdc: Productivity is key to improving living standards, so make it principal goal of economic policy.
.@ITIFdc calls for sea change in economic policy with comprehensive national productivity strategies. Paul Krugman famously wrote, “Productivity isn’t everything, but in the long run it is almost everything.” He is right: Higher living standards depend on increased productivity. But what can policymakers do to raise productivity? Most economists would start their answers by tamping down expectations, arguing that government can do little, other than perhaps to get out of the way. This is why Krugman went on to conclude, “So what are we going to do about productivity growth? Nothing.” Others offer only vague palliatives such as spurring competition, increasing public spending on education and science, and improving macroeconomic policy. But policymakers desiring higher productivity would be well advised to look beyond such advice from purveyors of the “dismal science,” because conventional economics is of little help in understanding the sources of productivity growth, much less in providing useful or actionable advice on productivity policy. Fortunately, other schools of economic thought, particularly innovation economics, and other disciplines, such as business administration, have discovered a myriad of ways in which public policies can drive productivity growth. Moreover, this work shows that a nation’s productivity growth will in fact lag unless governments implement smart and comprehensive productivity policies. These policies include the traditional advice of getting market conditions right and providing factor inputs to organizations, such as a skilled workforce. But they also go beyond the conventional solutions, which are grounded in a neoclassical economics framework that imposes a straitjacket on policymakers. The conventional theory holds that the only thing government can do is to remove barriers and fix policy failures so that firms reacting to price signals can do whatever they may choose to drive productivity. Incentives, including tax policies, to encourage organizations to adopt more and newer “tools” to drive productivity. The array of market failures is considerable when it comes to firms developing and adopting better tools to drive productivity. In particular, governments should use the tax code to provide incentives for acquisition of new capital equipment. Policies to spur the advance and take-up of systemic, platform technologies that accelerate productivity across industries. Many of the information technologies central to driving future productivity have chicken-or-egg network effects which mean that adoption will lag unless governments adopt smart, technology-specific policies. A research and development strategy focused on spurring the development of productivity-enabling technologies, such as robotics. The most important factor driving future productivity will be the development of better tools, including machines and materials. Governments need to focus a much larger share of their R&D budgets on advancing technologies that will reduce the need for labor. Sectoral productivity policies that reflect the unique differences between industries. In terms of productivity and productivity policy, industries differ in significant ways. Generic market conditions or factor supply policies do not reflect these key differences. Any effective national productivity policy will need to be grounded in analysis-based, sector-based productivity strategies. Finally, for nations to put in place sophisticated productivity policies, the single most important step is to establish productivity as the principal economic policy goal, ahead of other factors such as stable prices, low employment, reduced income inequality, or enhanced liberty. After that, nations need to establish the institutional capacity to conduct sophisticated productivity analysis, including sectoral analysis. Only after such analysis will nations be positioned to identify the right policies for productivity growth. Without a sophisticated understanding and approach to productivity policy, nations’ productivity performance will lag behind their potential. 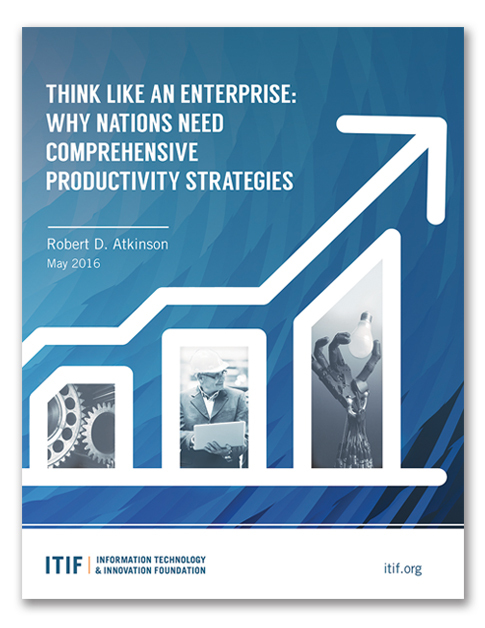 It is impossible to estimate the potential productivity gains that nations can achieve by putting in place sophisticated and comprehensive productivity policies as described in this report, but it is entirely reasonable to believe that the gains could be significant. In fact, if the United States and other developed nations were to adopt these policies, it is quite possible they could raise their annual labor productivity growth rates by 1 percent or more. The gains for less-developed nations that are further from the production-possibility frontier are likely to be at least double that. The report then reviews productivity performance in the United States and other developed and developing nations and explains why productivity growth has slowed in developed nations since the end of the Great Recession. It analyzes the current debate about the future of productivity, poised between one side popularized by Robert Gordon that postulates stagnation versus the other popularized by Erik Brynjolfsson that postulates exponential acceleration—and concludes that both are wrong. If nations adopt the right productivity policies, the best they can hope for is a revival of the strong productivity growth rates many enjoyed in the 1950s and 1960s. Part II provides a framework for thinking about national productivity policies, including how the prevailing neoclassical and neo-Keynesian economic doctrines provide a poor guide to productivity policy and why market forces alone will not maximize productivity. Public goods, externalities and other enterprise failures, and system interdependencies for development and adoption of productivity-enhancing tools all mean that markets alone will not maximize productivity. Rather, a more effective framework for thinking about productivity is to conceive of economies as large, complex enterprises, and not as price-mediated markets. Finally, Part III lays out a comprehensive and actionable agenda for spurring productivity growth, which most nations can use as a guide in tailoring their national productivity policy agendas. This agenda includes policy recommendations related to market framework conditions, factor inputs, organization incentives, productivity-focused R&D investments, systemic chicken-or-egg issues, industry-specific sectoral policies, and the ways in which governments need to organize themselves to advance effective productivity policies.